Personal Independence Payment (PIP) is starting to replace Disability Living Allowance (DLA) for 16 to 64 year olds as part of the Governments Benefit Reform. In this guide I will hop to bring you all the information you may need or signpost you to it when necessary. This guide is written for people with Fibromyalgia as their Primary Diagnosis and up to those who’s lives are severely effected by this condition. It is very important to realise if you also have other health conditions this advice only written for the Fibromyalgia part of your illness. Other conditions, for example cancers and terminal conditions are not covered in this guide but from a benefits point of view these other conditions may make your application for benefits less complicated, perhaps even attracting automatic entitlement in some cases. Therefore it may be beneficial so see benefit advice written with those other conditions in mind instead. The first step is to ascertain if your a new claimant or if you will be moving to PIP from DLA. From 8th April 2013 PIP starting replacing DLA for existing DLA claimants aged between 16 to 64 (inclusive). The government has released a “PIP Checker” for people to use to find out if and when PIP may effect your DLA. From the 7th October 2013 PIP could effect you if you are on DLA. a change in their DLA care or mobility needs will be asked to claim PIP. And claimants with existing fixed term DLA awards due to expire after 24 February 2014 will be asked to claim PIP. Young people turning age 16 will also need to claim PIP. All the remaining eligible claimants in receipt of a DLA award will be invited to make a claim for PIP. DWP plan to have contacted everyone by October 2017. They will write to individuals in plenty of time to explain what to do. They don’t need to contact DWP now. All DLA claims should have been reassessed by May 2018. If you do not currently get DLA then you will no longer be able to submit a claim for it, instead you should decide if you believe you are eligible for PIP. We can help you with that decision by clearly explaining what PIP is for and what the eligibility criteria is. Personal Independence Payment (PIP) has replaced Disability Living Allowance (DLA) for people who were aged 16 to 64 on 8 April 2013 or reach age 16 after that date. PIP & DLA help towards some of the extra costs arising from having a long term condition (this means ill-health or disability expected to last 12 months or longer) Like DLA these costs could be because of problems with your mobility or the cost of your care. These are not benefits that you can get “instead” of Employment, Job Seekers allowance or ESA as they are all to do with your ability to work instead. This is why PIP & DLA are very similar, PIP is simply the new form of DLA or DLA after benefit reform. As such we are in a transition phase from DLA to PIP and at the current stage all new claims will be for PIP. The next stage will be to transition people currently on DLA to PIP. This will not happen overnight and as such the target for completion is October 2018. Personal Independence Payment (PIP)is for people who were aged 16 to 64 on 8 April 2013 or reach age 16 after that date. It’s based on how a person’s condition affects them, not the condition they have. PIP is a benefit that people can get whether they are in or out of work and it is not affected by income or savings and is not taxed. As PIP replaces DLA it not possible to get both PIP and DLA at the same time, so people waiting on a decision about DLA are not entitled to claim for PIP. To qualify for help, claimants will have needed help with extra costs caused by a health condition or disability for three months or more and be reasonably likely to need help for the next nine months. Claims can be submitted during the qualifying period but entitlement to PIP cannot start until the qualifying period has been satisfied. PIP is made up of two components – Daily Living and Mobility. Each can be paid at standard rate, or enhanced rate for those with the greatest needs. There are 12 assessment criteria that consider the individual’s ability to carry out a range of everyday activities. The applicant will be assessed at a Medical similar to those ATOS Healthcare carries out for Employment & Support Allowance, they will be assessed against an established assessment criteria. Claimants must have spent at least two out of the last three years in Great Britain before they can claim PIP. A temporary absence abroad for up to 13 weeks, or up to 26 weeks for treatment, is allowed. There are special rules for people who have a terminal illness and are not expected to live for more than six months. The Department for Work and Pension (DWP) will deal with these claims faster and there will not be a need for claimants to attend a face-to-face consultation, or to fulfill the three month qualifying period. As this guide is for patients with Fibromyalgia as their primary condition these rules will not be contained within this guide however it is important to state these rules exist. As with other benefits the assessment criteria is contained within legislation, in this case The Social Security (Personal Independence Payment) Regulations 2013 Schedule 1. The claimant will be assessed against this criteria during a medical assessment similar to those ATOS Healthcare conducts for Employment & Support Allowance claimants. PIP has two components; Daily Living and Mobility. Each can be paid at standard rate, or enhanced rate depending on how many points the claimant has been awarded. For the Daily Living component a person being awarded the standard rate (after being awarded between 9 & 11 points) is referred to as having “limited ability to carry out daily living activities” and a person being awarded the enhanced rate (after being awarded 12 points or more)is referred to as having “severely limited ability to carry out daily living activities”. For the Mobility component a person being awarded the standard rate (after being awarded between 9 & 11 points)is referred to as having “limited ability to carry out mobility activities” and a person being awarded the enhanced rate (after being awarded 12 points or more) is referred to as having “severely limited ability to carry out mobility activities”. in a reasonable time period – no more than twice as long as the maximum period that anon-disabled person would normally take to complete that activity. Within each activity there are a number of descriptors, each representing a varying level of ability to carry out the activity. The descriptors range from being able to complete the activity without help, to being unable to complete the activity at all. Each descriptor has a point score attached to it. The point scores increase as levels of need increase. The health professional carrying out the assessment will advise which descriptor best matches an individual’s needs. The total score received for each activity under the Daily Living and Mobility components of PIP will determine the level of award a claimant might be entitled to. A total score of from eight to 11 points will mean a person is entitled to the standard rate of that component of PIP. A score of 12 points or more means the person is entitled to the enhanced rate of that component. Aids – are devices that help a performance or function, for example, walking sticks or magnifying glasses. Appliances – are devices that provide or replace a missing function, for example, artificial limbs, collecting devices (stomas) and wheelchairs. Personal Independence Payment (PIP) has replaced Disability Living Allowance (DLA) for people who were aged 16 to 64 on 8 April 2013 or reach age 16 after that date. This is initially for new claims only. Existing DLA claimants will be asked to claim PIP at some point from October 2013, but most won’t be affected before October 2015. If an existing DLA claimant decides to claim PIP then the Department for Work and Pensions (DWP) will continue to pay DLA until they make a decision on entitlement to PIP. If DWP find a claimant is not entitled to PIP, their DLA will stop. If a claimant is awarded PIP, DWP will make sure there are no gaps between benefit payments, so long as claimants send in information that is needed when DWP ask for it. To make a claim for PIP people should phone the DWP new claims telephone service on 0800 917 2222. The call will only take a short time to complete. If claimants are unable to use the phone because of a health condition or disability, someone else can call on their behalf. The claimant needs to be with the person calling and be able to give DWP permission to speak to that person on their behalf. Paper claims are used by exception only. I would advise that you list all this information prior to the telephone call as it will ensure you have all the details at hand and it will speed up the time it takes for the call. Once claimants have made the call to claim, and DWP have established that the claimant has met the basic entitlement conditions relating to age and residence, DWP will then send the claimant the “How your disability affects you” form (PIP2) and information booklet. This is the main form for claiming PIP, it is called “How your disability affects you” or form number “PIP2”. The initial phone call was only to assess you meet the “basic criteria” and this form will be your application for the benefit. Along with the form they should provide you with the How your disability affects you – Information booklet. At the moment you can not fill in the form online however you can view an example of a PIP2 form here. This may help you prepare your answers prior to receiving your form through the post. To help you complete your form you can use the enclosed guidance however there are likely to be other guides available on the internet and as PIP becomes more widespread. You may find the PIP section on the Citizens Advice Website useful when completing your application. I would also recommend approaching your local Citizens Advice Bureau (CAB) office for their assistance with either the form or the process. The person providing this advice should be a professional that works for an organisation that carries out assessments for the DWP, ATOS Healthcare or Capita. This person may be an occupational therapist, nurse, physiotherapist, paramedic or doctor. The PIP assessment will be delivered by assessment providers working in partnership with DWP. The assessment will be conducted by health professionals who consider the evidence provided by the claimant, along with any further evidence they think is needed. The assessment looks at people as individuals, and focuses on the impact their condition has on their daily lives and over a range of different activities. The health professional will complete the assessment and will send a report back to DWP. A DWP decision maker will then use all of this information to decide entitlement to PIP. The health professional will not make a decision on entitlement to PIP. Most people will be asked to a face-to-face consultation with a health professional as part of the assessment process. In some cases health professionals may be able to carry out the assessment without a face-to-face consultation. This will be decided on a case-by-case basis. The face-to-face consultation may take place at a designated assessment centre or in the claimant’s own home. The claimant will be encouraged to take someone along to the consultation to support them if they would find this useful. The person can participate in the discussion. The person chosen is at the discretion of the claimant and might be, but is not limited to, a parent, family member, friend, carer or advocate. If it is clear that the claimant requires more than one person to accompany them to enable them to attend a face-to-face consultation, this should be identified as part of the booking process. The Assessment Provider (AP) may decide that the claimant would benefit from a home visit rather than a consultation at a medical centre if they require multiple people to assist them to attend the face-to-face consultation. DWP have asked APs to ensure that claimants travel no more than 90 minutes (single journey) by public transport to their assessments. This figure is an absolute maximum and it is expected that travel time will be far less for the majority of cases. At the consultation, the health professional will ask questions about the claimant’s circumstances, their health condition or disability and how this affects their daily lives. The health professional may also carry out a short physical examination, but claimants will not be forced to do anything that causes them pain, embarrassment or discomfort. The APs will ensure that the health professionals have the right skills and experience to assess any claimant referred to them. DWP believe that in most cases all health professionals should be able to assess the individual, even if they are not a specialist in their condition. There are no targets on the time required for face-to-face consultations. Consultations will need to be as long as necessary to reach the evidence-based conclusions on individual cases. APs have a target to return 97% of cases to DWP within 30 working days with on average no cases talking longer than 40 working days. 99% of terminally ill cases must be returned within 2 working days and all of them must be returned within 5 working days. This is likely to be one of the most controversial aspects of PIP, as this has shown with ATOS & ESA. After the consultation, a DWP team member considers all the evidence, including any advice from the health professional and any additional evidence provided by the claimant. The DWP team member (not the health professional) then makes a decision on the PIP claim and writes to the claimant to explain how they made the decision. If PIP hasn’t been awarded or the award is less than a claimant’s current DLA award, then the DWP team member will try to phone the claimant to explain their decision. This call will be made seven days after the decision letter has been sent to the claimant. Claimants who receive an award for PIP will get a detailed decision letter containing specific details about PIP payments. DWP will pay PIP every four weeks into a bank account, building society, credit union, Post Office Card account or by Simple Payment as indicated by the claimant at the start of their claim. Claimants who are terminally ill will receive payments weekly. Awards of PIP will be based upon the circumstances of the individual and will look at the impact of the disability or health condition and the extent to which they are able to participate in society. It is important to understand the decision is made by a Decision Maker for the DWP based on the Evidence, this is your form PIP2, any evidence you have sent in with your form up to your face-to-face consultation and the advice of the Medical Professional who assessed you. It is a simple points calculation based on The Social Security (Personal Independence Payment) Regulations 2013 Schedule 1 then any other rules that may be applicable within the entire Social Security (Personal Independence Payment) Regulations 2013 such as terminal illness. You will be awarded you benefit for a certain time, called a reviewing period. If you are a DLA claimant you will be familiar with this process. At this point it is unclear exactly what will take place when you are being reviewed. The review periods for ESA could give us an indication as in most cases when your award is due for review the DWP send out a new ESA50 for you to fill in. It then goes to ATOS medical for advice, a decision about attending a new medical is made and you continue through the process like a new claimant. This could indicate that for PIP the DWP would send you a PIP2 form to complete, this would then be sent to an Assessment Partner (ATOS or Capita) who provide DWP with advice. A decision maker then decides if a face-to-face assessment is required and you proceed through the system. Shorter term awards of up to 2 years will be given where changes in needs could be expected in that period. Longer term awards, such as 5 or 10 years, will be given where significant changes are less likely but with reviews in the interim where some change in needs may be expected. Ongoing awards will be given in the minority of cases where needs are stable and changes are unlikely. However, these awards will be periodically reviewed to ensure that the level of support is still appropriate. Awards made under the Special Rules for terminally ill people will be for three years. The daily living component will be paid at the enhanced rate in all cases. Payment of the mobility component will depend on whether the claimant needs help to get around, and if they do how much help they need. Any Appeal and Tribunals are based on changes brought into effect within The Welfare Reform Act 2012. Once a decision has been made on a PIP claim, DWP will issue a decision notification to the claimant advising them of their award or disallowance, giving the reasons for the decision and advising what steps the claimant needs to take if they dispute the decision. Claimants have one calendar month from the date of issue of their decision letter to request a mandatory reconsideration. If a claimant isn’t entitled to PIP or if they are awarded a lesser amount of PIP than their previous Disability Living Allowance (DLA) award either because of reassessment or a review of their claim, the DWP decision maker will telephone them so that they can discuss the decision and answer any questions the claimant or someone acting on their behalf may have. If after the decision maker has discussed the decision, the claimant still disputes the decision and would like DWP to look at the decision again, they can request a mandatory reconsideration. The claimant will be asked to be specific about the points at issue or descriptors they are unhappy with and will be encouraged to send in any further evidence or information they may have to DWP at this point. My Advice: This could potentially confuse some claimants. You need to understand that the telephone call is not just to give information. If you receive a telephone call after you have asked for an appeal you must decide if the discussion has changed your your mind. If he/she has you need to clearly state due to the information received you no longer wish to pursue your appeal to the mandatory reconsideration request. More Importantly if the discussion has not changed your mind then you need to clearly state that you still wish to pursue your appeal to a “mandatory reconsideration”. This is very important because as a result of this telephone conversation the DWP Decision Maker can terminate your appeal. From a legal standpoint if a dispute about this telephone call is raised it may be difficult to prove what was discussed and what the outcome was. I have advised people who have received this phone call and believed the Decision Maker was informing them them they were terminating their appeal or had already decided to do so. This is not their decision, it is yours. You should not make this decision lightly due to the fact you are receiving information and being asked for a decision “on the spot”. I would always recommend time to make a decision or request a “mandatory reconsideration” if you do not understand every aspect of this telephone call. Important consideration regarding Evidence: When first request an Appeal you should consider if any further evidence is obtainable. At this stage the responsibility to submit evidence is yours, not the responsibility of the DWP. If you are disputing the Assessment then you need to provide evidence that contradicts it. It is rarely sufficient to state “I believe I am more severely effected than the assessor has stated.” This is simply how you should start an appeal against the assessment but you should try wherever possible to provide evidence to back up any claim. As far as the DWP are concerned they have enough evidence to make a decision already, they are only going to reconsider their decision if there is new evidence. If possible produce medical reports, often after you have had a Specialist Consultation as a result of a GP referral the Specialist will send your GP a report, if you claim benefits you should routinely request a copy of all reports. Consider requesting access to existing reports, consider commissioning your own report from your GP or Consultant. However this will be at your own cost. This is also an important time as this is when your “snapshot” will be taken, any case that is pursued to Tribunal will be about how you were medically “at this time”. They will not except evidence that your condition has deteriorated since this snapshot was taken. If you are in doubt about an item of evidence, as long as it does not harm your case I would send it with your appeal. Consider obtaining a witness statement from a carer any evidence that contradicts the assessment criteria is useful and it is always worth refreshing yourself on the criteria. When a mandatory reconsideration request is received, a second DWP decision maker will look at the decision and any additional evidence, including any additional evidence or information that has been provided by the claimant to decide if the original decision is fair and consistent with the evidence. A letter called the Mandatory Reconsideration Notice will be issued to the claimant responding to any issues that they had about the decision and advising them of the outcome of their mandatory reconsideration request. It will also contain the claimant’s right of appeal against the decision and advise them how to make an appeal to HMCTS and where they can get an appeal form. If, after DWP have reconsidered the decision, the claimant still disputes the decision, they can lodge an appeal directly with HM Courts & Tribunals Service (HMCTS). Once you have received the Mandatory Reconsideration Notice you have one calendar month from the date on the notice to appeal to HM Courts & Tribunals Service (HMCTS). You should decide if you wish to make this further appeal to have your case heard by a Tribunal. If you believe this decision is wrong because you meet the criteria for PIP then do not be put off submitting the appeal because you may find the process daunting. The Tribunal is set up in such a way that it allows claimants to present their own case. If you are not fully confident in your case and knowledge of the law then consider approaching a professional for help at this stage. I would recommend approaching your local Citizens Advice Bureau (CAB) office as they may be able to help you, another option is a Solicitor. Along with the Mandatory Reconsideration Notice you should receive details on how to appeal. You must sent this appeal to HM Courts & Tribunals Service (HMCTS) as the DWP state:“If the claimant sends the appeal in error to DWP, DWP will not forward the appeal request to HMCTS. DWP will first check that a Mandatory Reconsideration has been carried out, and if not will treat any appeals they receive as a request for a mandatory reconsideration. If the claimant has had a Mandatory Reconsideration DWP will return the appeal to the claimant.” You also need to include a copy of the Mandatory Reconsideration Notice from DWP as you have to demonstrate that you have asked the DWP for a Mandatory Reconsideration and that you still wish to appeal that decision. When HMCTS receive the appeal, they will validate it and send it to DWP for a response. DWP will send their response back to HMCTS within 28 days. HMCTS will administer and hear the appeal – you can find more information about HMCTS on their website. Most claimants will not need to read this section, if you claim other benefits it is worth seeing if it is on the following list to see how PIP may or may not effect your claim. Personal Independence Payment (PIP) has replaced Disability Living Allowance (DLA) for people who were aged 16 to 64 on 8 April 2013 or reach age 16 after that date. This is initially for new claims only. Getting DLA is a commonly accepted and broad definition of disability that is used by other benefits and schemes as a way to identify people who need extra support. PIP will also be the main way of getting other disability benefits and services across the Department for Work and Pensions (DWP) and other government departments. Claimants will be able to use their PIP award letter as proof of being entitled to other disability benefits. In some cases, DWP will share information about PIP awards within the department and with other government departments to enable claimants get other disability benefits and services. For some schemes, such as the Blue Badge Scheme, there are alternative ways of accessing the benefit which do not rely on a particular rate or component of PIP or DLA. The Welsh and Scottish Governments may choose to use different passporting rules for their schemes to those that apply in England. For passporting purposes the highest components of DLA are equivalent to the enhanced component of PIP, for both Daily Living and Mobility. 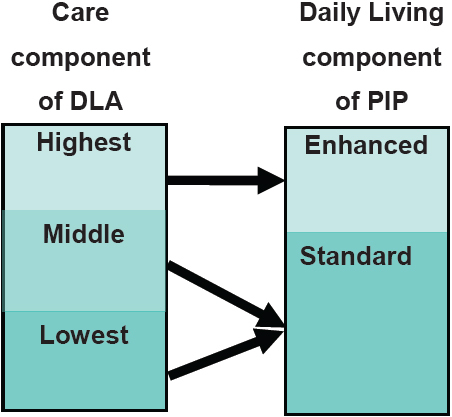 The middle and lowest components of DLA are equivalent to the standard PIP Daily Living component. 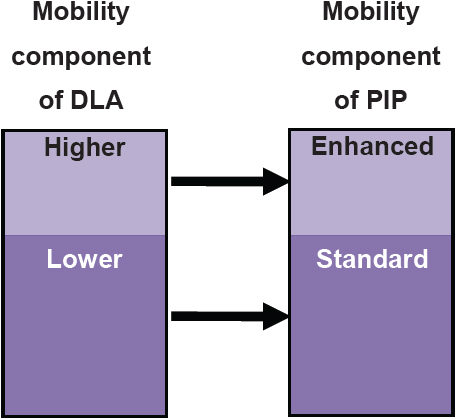 The lower Mobility component of DLA is equivalent to the standard Mobility component of PIP. An Access to Work grant is money for practical support to help people do their job. It’s for people with a disability, health or mental health condition. The aim of Access to Work (AtW) is to support disabled people into work, and when in work to retain it by reducing the inequalities between disabled and non-disabled people and removing practical barriers to work. The money they get can pay for things like: specialist equipment; travel when you can’t use public transport; and a communicator at a job interview. How much a claimant gets depends on circumstances rather than a direct passport from PIP. The Ministry of Defence (MoD) has introduced a new benefit that will provide financial support for injured service or ex-service personnel. It will be called the Armed Forces Independence Payment (AFIP) and is being introduced from 8th April 2013. The benefit will simplify the financial support for members of the Armed Forces who have been seriously injured as a result of their service since the introduction of Armed Forces Compensation Scheme (AFCS) in 2005 and in the future. AFIP claimants will receive a flat-rate benefit which for passporting purposes is the equivalent of the enhanced rates of the daily living and mobility components of PIP. Claimants who choose to claim AFIP will not be eligible for PIP, DLA or Attendance Allowance (AA). Claimants who choose not to apply for AFIP will be treated as a DLA, PIP or AA applicant in the usual way. Although from June 2013 claimants between the ages of 16 and 64 will no longer be able to claim DLA, but must instead claim PIP. Further information can be found on the AFIP Website. As with DLA, getting PIP can provide a way of getting other help, such as Blue Badges or concessionary travel passes. Local Authorities can also issue the Blue Badge through guidance and further assessment. This is called the ‘with further assessment’ category. The Department for Transport (DfT) guidance will state that receipt of 8 points in the ‘moving around’ activity will entitle the claimant to a Blue Badge in England, and receipt of 8pts in the ‘moving around’ activity or the ‘communicating verbally’ activity will entitle the claimant to concessionary travel. The Welsh Government have confirmed that Blue Badge eligibility will be based on a score of eight points or more on the ‘Moving Around’ activity or 12 points on the ‘Planning and following a journey’ activity. They haven’t yet announced the eligibility for concessionary travel. The Scottish Government has consulted on the rules for eligibility for blue badges and concessionary travel, but has not yet announced the outcomes. The standard and enhanced rate of the Daily Living component of PIP will form part of the gateway to Carer’s Allowance, as the middle and highest rate Care component of DLA did before it. PIP standard or enhanced rate Daily Living component will provide a gateway to this credit. Carers Credit will continue to contribute towards State Pension entitlement. As with DLA and Attendance Allowance (AA), households will be exempt from the benefit cap (www.gov.uk/benefit-cap) where a claimant (of any of the benefits subject to the cap), partner or qualifying young person is entitled to PIP. A qualifying young person is someone for whom the claimant or partner receives child benefit, [because they are in full-time ‘non-advanced’ education at school or college, or starting an ‘approved’ training course]. An adult non-dependant in receipt of PIP living within the household does not exempt the household from the benefit cap. They are considered as a household in their own right. Receiving any component or rate of PIP will mean claimants are entitled to the disability premium. The standard or enhanced rate of the Daily Living component will entitle claimants to the severe disability premium. The enhanced rate of the Daily Living component will provide entitlement to the enhanced disability premium. The PIP enhanced rate Mobility component will act as the gateway to the Motability scheme. Universal Credit will replace the current income-related benefits, such as Income Support, Jobseekers Allowance (income-based), Employment and Support Allowance (income-related) and Housing Benefit, including their components and rates. PIP will not usually have a direct link to entitling adults to additional support within Universal Credit. Her Majesty’s Treasury have announced that they will use receipt of the PIP daily living component at either rate to define a ‘vulnerable person’ for tax purposes. How your disability affects you – Information booklet. Get essays virtual in a single then click with the consistent composing care. Our essay article writing provider could save you from panic and assist you to order essay at discount prices buy an essay . Everyone in this world does would need to create an essay in the classroom or school existence. Obtain essay or write down it one self. Discover why you can apply each write my paper . You possess came across among the best special penning assistance by going online. For everybody who is exhausted by lots of assignments – our top quality scholastic guidance is on this site to help you to get custom-made reports at cheap prices. We work closely with any tasks even at small observe essay help . Do you wish to comprehensive your document with special posting business? Not be concerned’ only hire our professionals for superb resolutions help in writing an essay . Our company is providing you to invest in essay internet from this point and uncover great levels as part of your training. Our low price but good-standard subject material will unquestionably give you good results essay writing services .